Oliver North was a US Marine Corps officer. Currently, he is a political commentator, host of War Stories with Oliver North on Fox News Channel, a military historian, and a New York Times best-selling author. North was at the center of national attention during the Iran-Contra affair, a political scandal of the late 1980s. North was a National Security Council member involved in the clandestine sale of weapons to Iran, which served to encourage the release of U.S. hostages from Lebanon. North formulated the second part of the plan: diverting proceeds from the arms sales to support the Contra rebel groups in Nicaragua. Oliver North graduated from the United States Naval Academy in 1968 and served as an infantry platoon commander in the Republic of Vietnam. His military decorations include the Silver Star, the Bronze Star with a “V” for Valor, two Purple Hearts and three Navy Commendation Medals. Following Vietnam, he served with distinction in a variety of assignments both in the United States and abroad. In August, 1981, he was ordered to the White House for duty with the National Security Council (NSC) staff and eventually was named deputy director of Political-Military Affairs. While on the NSC staff, Colonel North was involved in planning the liberation of Grenada and played a major role in the capture of the hijackers of the cruise ship, Achille Lauro. He helped plan the U.S. raid on Quaddafi’s terrorist training camps in Libya, after which he was targeted for assassination by Abu Nidal. Colonel North is perhaps best known for the role he played in carrying out President Reagan’s policy of support for the Nicaraguan Resistance and his involvement in the rescue of American hostages held in Beruit, Lebanon. 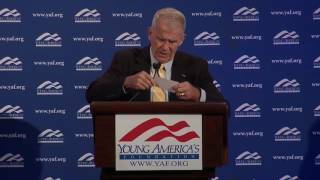 Oliver North is chairman and co-founder of Guardian Technologies International, Inc., a Virginia-based manufacturer of body armor for law enforcement personnel. A bestseller, Colonel North has written two books, Under Fire and One More Mission.